Yoga is about honouring your body, listening to it , and working at the pace that is just right for you. 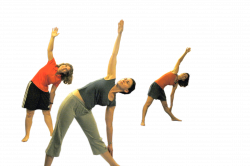 Our open Gentle Yoga classes are suitable for you to join at any time. Yoga is an ancient Indian practice dating back to 3000 BC. It is a scientific system designed to generate health, happiness and a greater sense of self. Yoga works on both the body and the mind - it gives you poise, balance, strength and flexibility. It also makes you more attentive and centred. Yoga is a way of life and ensures greater efficiency at work and better control over mind and emotions. The asanas (postures) evolved over the centuries have been perfected to help those who practise yoga maintain a high standard of health. Yoga is open to anyone who is interested in it. These days everyone from business people, film stars, celebrities and sports personalities to the average person is doing yoga as a way of keeping healthy, feeling happier and dealing with stress. Age is no barrier - you can start yoga at any stage of life. You are not required to be in perfect physical shape or believe anything in particular. The only prerequisite is an honest commitment and an open mind. At Om Yoga we endeavour to create public awareness about this simple and natural therapy for regaining and maintaining physical and mental health. During our yoga sessions we teach some of the important asanas, pranayama (breathing techniques) and relaxation methods. We also try to provide information about their benefits/contraindications and efficacy in treating various disorders. In order to reap the maximum benefits, however, you must practice regularly under expert guidance. Patience and perseverance are the keys to unlocking the full benefits of yoga.